At one time, the railroad line that is now the Willapa Hills stretched to the Great Lakes. Photo credit: Gene Bisbee. Our local parks are where we recreate, congregate and escape. Full of scenic wonders, idyllic spots of solitude and memories with friends and family, our “backyard” parks are also sites of historical stories. 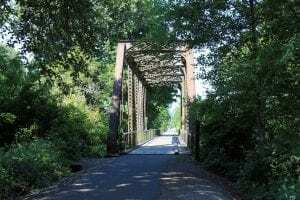 While each park has a unique foundational history, we have selected five of Lewis County’s favorite parks to highlight. Created from the 1800s up to WWII, these five popular Lewis County Parks have been visited by millions, inspiring hometown pride, adventure and happiness. Next time you’re there, take a minute and reflect on how they were created and the legacies they now hold. Fort Borst is full of history, most of which is well over a century old. 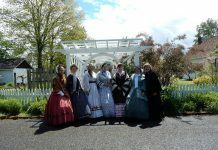 Photo courtesy: City of Centralia. Quite possibly the most famous and oldest part of the park is a wooden structure. While the park gets a large number of visitors each year, fewer and fewer are aware of the unique history of this section of land. Fort Borst was once nothing more than a tiny fort along the Chehalis River. Constructed in 1856, the blockhouse was built to store supplies during the Washington State Indian War of 1855-1856. The war was between the Washington Territory and a confederation of Western Washington tribes led by Nisqually Chief Leschi. Lasting just six months, the blockhouse was sold for $500. 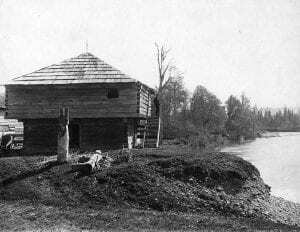 Originally, the blockhouse was located on the Chehalis River near the mouth of the Skookumchuck River. In 1919, it was moved to Riverside Park; and in 1922, it was once again moved to the present site in Fort Borst Park. The park is also the homestead of Joseph Borst and his family. He helped build the blockhouse, then purchased it and eventually built a beautiful home, which is still standing and open to enjoy today. Stretching back into the 1800s, the Willapa Hills Trail has a rich history. Once providing access all the way to Lake Superior, the trail was part of the Northern Pacific Railway. In the 1950s, this track started seeing less and less use, and by 1990 it was abandoned. Washington State Parks acquired the land in 1993, saving it from falling by the wayside. Today, the old railway line is a hiking and biking trail, running for 56.5 miles, though a few sections are closed. The trail is still being built out and soon will retrace the route that helped brings job and industry to the region. If it wasn’t for the Great Depression, Rainbow Falls might not be a park. In 1935, the Civilian Conservation Corps (CCC) was tasked to build a park near this scenic destination. The CCC was a public work relief program that, from 1933-1942, helped give jobs to unmarried, unemployed men ages 17-28. In those nine years, it is said that the CCC planted nearly three billion trees, constructed trails, lodges and related facilities in more than 800 parks nationwide, updated forest fire fighting methods, and even helped build a network of public roadways in remote areas. One of those projects was at Rainbow Falls, where the Civilian Conservation Corps built the park and its log structures in 1935. Today, Rainbow Falls is a State Park and one of the few places in Lewis County to wander amongst old growth trees, untouched by saws. Before the Great Depression and the CCC, Lewis and Clark State Park was already in existence. The park was first established in 1922 to preserve the few remaining old-growth forests along the Washington State highway system that was being built. Largely overlooked and underused, the park got a dose of energy in the 1930s, when Lewis and Clark State Park was host to a CCC camp. The young men that resided here were employed at the camp and worked at nearby locations, completing much of the park’s early development. According to Washington State Parks, the park’s day-use area still appears much as it did after the CCC’s work was completed, featuring several rustic picnic shelters and restrooms made from native logs and stone. Mount Rainier is Lewis County’s most famous park. Photo courtesy: Douglas Scott. Always iconic, the Mount Rainier region has been protected by the US Government in one way, shape or form since 1893. Originally part of the Pacific Forest Reserve, the area was increased in 1897 and renamed as the Mount Rainier Forest Reserve. 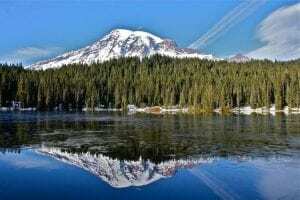 Mount Rainier became the Nation’s fifth National Park on March 2, 1899. On top of being the most visible National Park in America, Mount Rainier National Park has the honor of being the first park created from a National Forest. The park was created, thanks in part to John Muir who lobbied the Sierra Club, the National Geographic Society, and even the Northern Pacific Railway to tell Congress they wanted the land protected as a National Park. Today, Mount Rainier National Park is the Pacific Northwest’s second-most visited National Park and a place that continues to inspire visitors, young and old.